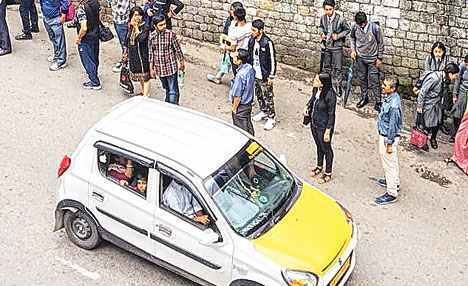 Gangtok: Daily commuters have been facing inordinate delay to avail themselves of taxis in Sikkim because of rush of tourists, prompting the transport department to promise to ply more buses from Thursday. The popular mode of commute in and around Gangtok is shared taxis, which are mostly hatchback cars. But they are now busy catering for tourists, leaving the local commuters in a lurch. The tourists book a car for a day or more to visit different places in the Himalayan state, and the taxi drivers find such trips more lucrative. K. K. Sampang, a regular commuter on shared taxis, said he had to wait for nearly an hour at Daragaon in Tadong to take a taxi to Lall Bazar on Wednesday afternoon. "I had gone down to the Adhar Office in Lingding and I have been waiting here to catch a taxi for nearly an hour without much luck," he said when The Telegraph caught up with him at Daragaon. There were at least 30 others waiting for cabs alongside him. S. B. S. Bhaduria, the secretary of the state transport department, said no one had brought the taxi crunch to his notice, but he would instruct officials to operate more buses between Gangtok and Ranipool, which is a distance of 12km. "About 10 to 12 buses ply between Gangtok and Ranipool. We will increase the frequency from tomorrow (Thursday)," Bhaduria said, adding that he would also take stock of the situation at a review meeting of the road transport officers here on Thursday. Bhaduria acknowledged that the crisis was a result of the heavy rush of tourists. "We will also increase the number of buses to Siliguri (to cater for the tourists," he said. Taxi drivers said the tourist season was the only time they did good business. "During off season, I hardly earn about Rs 1,000 a day ferrying daily commuters. Now, I get to earn nothing less than Rs 3,500 by taking tourists to different places in and around Gangtok as well as outside the town," said a driver who wished not to be identified. Daily commuters have been facing inordinate delay to avail themselves of taxis in Sikkim because of rush of tourists, prompting the transport department to promise to ply more buses from Thursday.